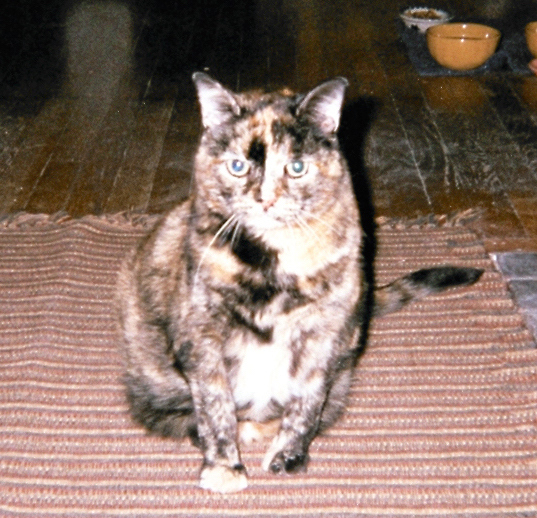 When I first brought Pyewacket, a 10-year old tortoiseshell cat, home from the local shelter, she wandered screaming through the house every night before bedtime. Four years later, she was still doing that—and meowing loudly when I come home, before and after using her litter box, and whenever I go near the kitchen. I took her to three different vets. The first diagnosed gingivitis; we addressed that, and the screaming got worse. The second vet said it was feline senility and advised leaving a nightlight on, which had no effect. And the third said Pye was just naturally talkative. None of which helped me deal with being assaulted, day and night, by screams. So I tried saying “no.” I tried talking in a soothing whisper. I tried cuddling, screaming back, and I tried water squirts from a spray bottle [Editor’s note from Liz: spray bottles are no longer recommended by cat behaviorists; like physical punishment, they make your cat trust you less, causing distress and making things worse.]. When none of the above worked and I caught myself wishing I could take her back to the shelter, I realized I had to get serious about solving this problem. I started by scouring the Web, and discovered that my first mistake had been to lump all her noises into the catchall category of “screaming.” Cats hiss, growl, shriek, spit, chirp, purr, chatter, murmur, mew, meow, moan, and yowl—and all that vocalization is normal. Even increased vocalization is often normal: a cat may be noisier than usual when she’s hungry, in heat, grieving, lonely, bored, in a new home, or when there’s a strange cat outside. With that in mind, I started noticing the sounds Pye made, and I soon realized that she purred, chirped, and meowed—all of which I welcomed. But there were two sounds that I wanted to discourage: “demand meows” and yowls. Meows are something cats in the wild rarely do. Feral kittens meow to their mothers and stop once they grow up—but because domestic cats think of us as Mom, they continue to talk to us in kitten-ese. And when they want something urgently, they use a “demand meow,” which is rapid, repeated, and loud. Pye also yowls, a sound that’s far more piercing and distressed than a demand meow. (To hear one, check this YouTube link in which a bored kitty tries to get her owner to play.) 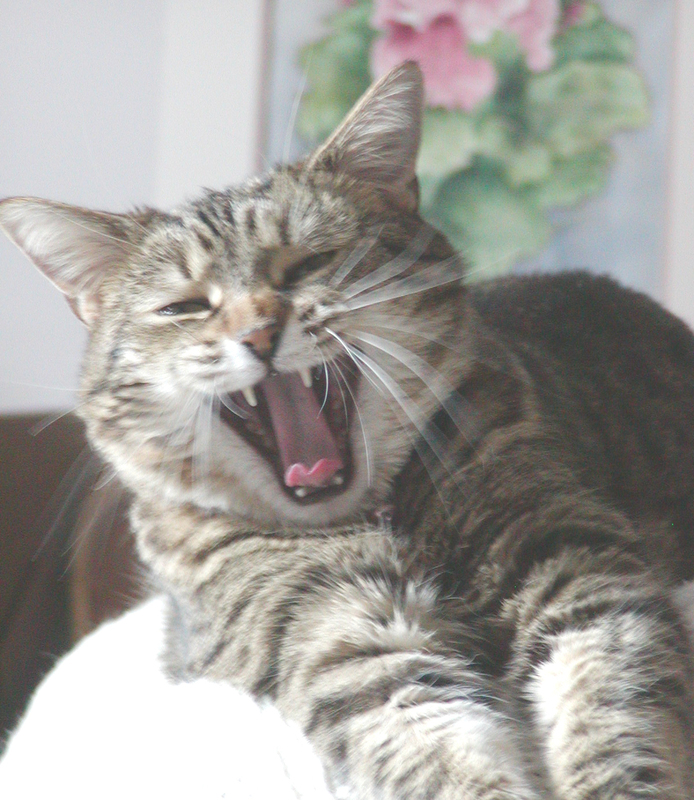 Yowling can have many causes: arthritis, dental disease, thyroid dysfunction, cancer, impaired sight or hearing, pain, hearing loss, anxiety, conflict, attention-seeking, grieving, mating, boredom, or cognitive decline. That’s a scary list, so if your cat yowls—especially if she just started—you should take her for a complete exam. Before you panic though, bear in mind that, as per the University of California School of Veterinary Medicine Behavior Service, the most common cause of excessive vocalization is attention-seeking. There’s something the cat wants and she’s learned that vocalizing is the way to get it. Changing that learned behavior isn’t easy though. When you try, a cat will vocalize louder and longer before she finally changes, and most owners will give up. Step One was to make an effort to be calm and quiet myself, to set a good example for her. Step Three was to reward Pye when she was quiet, using extra attention, pets, and praise. Step Four was to give her a joint supplement—on the theory that her yowling, which mostly happens when she’s alone downstairs at night, might be due to arthritis that makes it painful to go up stairs. That was my plan, my experiment. And how did it work, you ask? As predicted by the experts, the noise got worse at first. And then it got worse. And then worse. Three weeks in, I wondered if any of the experts writing online articles had ever tested their theories on an actual cat. So I did further research, and discovered that torties are generally agreed to be a sensitive, vocal, strong-willed breed. I was afraid Pye would always be anxiety-prone, noisy, and stubborn…but rather than give up, I decided to walk a mile on her paws. 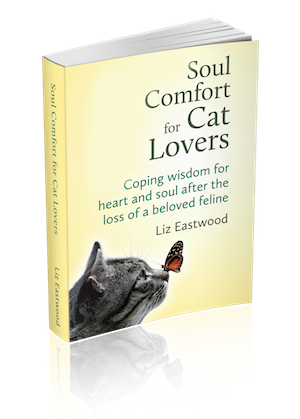 She was a true believer in the Power of Meow—and when that power suddenly stopped working, she felt helpless, confused, and terrified. She didn’t understand the lesson I was trying to teach, and she was trying what used to work as hard as she could. I realized it was up to me, then, to communicate in ways she did understand. For example: when I come home from work, she’s half-hysterical from being alone all day. I therefore began to scoop her up and cuddle her until she calmed down. Then I set her down, and when she started her demand meows, I went to her (as often as necessary), gently held her head still and her mouth shut, looked into her eyes, and said “No” confidently. She doesn’t like having her head held, she knows what “no” means, and she’s smart enough to make the connection between those things and her meows. I then talked to her in a whisper as I made her dinner. When I use that 3-part approach on coming home, she usually switches to sweet, excited mews that are much quieter and less frequent than her demand meows. Her breakfast demands are harder to silence. I take the same approach, and while it doesn’t always work as well, the volume and frequency are much better than before I started my training efforts, and vastly better than what she did when I ignored her. Her nighttime yowling has also improved. I don’t think the joint supplement helped; I think the root cause is that when she goes downstairs for a nap or a snack, she thinks I’ve left (because the house is quiet) and gets frightened. Ignoring her just makes her more afraid, so I respond with a firm “No.” Sometimes I have to repeat it a few times, but her yowl becomes a demand meow or two and then stops. I want to let my Wild Thing be as free as possible in my un-wild world. Now that I’ve found an approach that works with Pye, I think that she’ll continue to improve—though, given her breed and personality, Pye will probably always be a Loud Little Cat. It helps me to be patient when I remember what one commenter said about the YouTube video mentioned above: “As annoying as this can be, I would give almost anything to hear my cat yowl again.” My time with Pye is limited, so I try to love her well every day. It also helps to remember that dogs have been living with humans for 40,000 years, while cats have only shared our homes for perhaps 10,000 years. They’re less domesticated. They remember what it was like to live by their wits—alone, free, and fierce—and I respect that. Pye and I had to find a working compromise on the issue of screaming, but I want to let my Wild Thing be as free as possible in my un-wild world. My black cat Inkee used to be very quiet. When we were a three cat household, he was the dominant cat, and I think he allowed the other two to do all of his talking for him. Since they’ve passed away, and he’s survived to be not just old, but geriatric (19 1/2), He’s become much more vocal. He does have thyroid disease, which is under control. But I think it’s poor eyesight also. He definitely has cataracts. I try to give him as much love and attention as I can. I’ve debated whether or not to get him an older cat or a kitten for a companion, as he seemed happier with the other cats. He is so old and frail, though, I’m afraid that he would be bullied or harassed and that it might shorten his life. This is great! I have a cat that lets out blood curdling meows that will scare me to death! I’ll think she’s still in the bedroom, sleeping, what else, and she’ll come find me. I’ll be in the kitchen with my back turned, and she gives it everything she’s got and it scares the living daylight from me! When she’s ready for bed, I’ll tell you, she’s relentless! Until April I had a tortie who was the same way for the first 5 or so years after I adopted her. Yowling was worst just when I got home and in the middle of the night, sometimes just after I woke up. I basically settled on the same sort of approach as you (though I never formalized it as a plan, just something I started to do). I would pick her up as soon as I got home and carried her around the room as I put my things away. Then at night before I went to bed I would pick her up, give her some cuddles, bring her to the bedroom and put her on the bed as I got ready for sleep. Shortly after that she started to jump up on the bed and sleep there for parts of thethe night and her yowling pretty much stopped (except for when the neighborhood stray cat wandered by outside). Thank you so m uch, Steve! I lost my beloved Pye to cancer just a year after writing this post, and I miss her every day. It took nearly two years to find a new furbuddy, and wouldn’t you know…I got another yowler! This one is also a tortie, and her personality is just like your cat’s: on edge, stressed, goes into panic mode over nothing…so I appreciate your sharing what helped with your kitty. It reminds me of what I need to do for this new little drama queen. 😀 Have a most happy holiday season…and may you always have love in your life. I’ve had cats all my life but never had a talker until my grey tabby, Shabo. I loved that he talked and I would talk back to him. When I lost him and his brother, orange tabby, Puff, not a talker, I missed his talking. Had intended not to adopt anymore as I’m now up in age but, 3 mos. ago a feral calico tortie came into my yard and I didn’t want her to have to brace the cold winter outside and adopted her. She has been a joy having. She is so very well behaved as if she had gone to finishing school. I never had a tortie before but find her beautiful marbled coat, her constant display of affection, as well as sometimes being talkative, is a wonderful combination. I’m so happy she found me!!! Thank you so much, Adrienne! I’m happy she found you, too! Torties are really special, aren’t they? I work at a humane society now and our office cat is a tortie — and she loves on me all day long, which makes work so much more enjoyable. 😀 I hope you and your new tortie baby have a MOST happy holiday and a long and wonderful life together. I’m pleased (and relieved!) to report that Pye no longer wanders around at night yowling, and even her demand meows are dramatically better. The main reason seems to be a food switch to something she enjoys (Merrick’s Purrfect Bistro Duck, canned) but doesn’t crave like her old food (Taste of the Wild Trout, canned). I’ve also been giving her extra attention through the day, and I created a ritual that we do morning and night that I call Kitty Hugs. Before I get out of bed and right before we go to sleep, I say, “Kitty Hugs!”. She understands the words and lies down on her side, ready for me to slowly rub every inch of her, from nose to tail, as I croon “Rub the head, rub the neck, rub the shoulders” and so on…and then we end with a few gentle head butts. She really loves her Hugs, and I think it makes her happier and calmer.But even before I started that, the switch in food made a major, major difference. As best I can figure, her mealtime screaming was primarily due to either liking her food TOO much, or to her food not fully satisfying her so that she always felt hungry. I only want to talk about squirting cats wirh squirt bottles. Ive done this ever since ive had cats and it never changed the way they acted towards me. Now all I do is shake it and they stop whatever they’re doing, which is something they’re not supposed to be. So it works and it’s not harmful. Of the 6 there are 2 big talkers, and 1 sometimes talker. My Tuxedo male — he has different vocalizations depending on which family member he’s looking for. When it’s me, it sounds like “Mom.” When it’s my niece, it sounds like her name. And when he’s hungry it’s a totally different vocalization. He is the consummate entertainer when he’s in the mood to talk. We have a young female who’s more white than black — she is a “warbler” — she’ll coo and warble through the house all day long. It’s almost as if she enjoys the sound of her own voice. Then there is the older female Ragdoll that we rescued (along with her 2 brothers) — she will SCREAM when one of her brothers looks at her and she doesn’t want him around, or if she’s hungry, or if it’s just for attention. The other 3 — are mute compared to the others! LOL They will greet you with a quiet, “meow” and talk more with their purring than with their voice. Talkers can be tiring — but I wouldn’t trade any of them for the world! I recently adopted Archie from the local Humane Society and for the first two weeks he meowed loudly and paced all night long. All. Night. Long. More than once I considered bringing him back. I tried numerous tactics as every day I’d scour the internet for ideas; Feliway, Rescue Remedy, shushing, ignoring, cuddling, playing. I was exhausted! In the last week I’ve started a similar routine, in that when I get home, I drop my bags and hold him close until he settles. It only takes a minute or two. I don’t have to hold his mouth or anything, I just hold him tight and close to my heart and take some slow deep breaths. When I put him down, his meowing is not so frantic, he’s just asking for dinner. 🙂 As for night time, well I guess it’s like having a baby – when his meowing gets frantic, I get up and do the same thing – hold him close and take a few deep breaths. It’s now been 3 weeks and we went to the vet yesterday and Archie is a strong healthy cat. He’s also settling down. I even slept through the night last night. My 19 year old kitty yowls loudly at night and sometimes during the day. Started a few years back and I noticed at the same time she was losing her hearing. I think when we’re asleep at night she wakes up and thinks she is all alone and feels uneasy because she cannot hear any more. Happens during the day when she wakes up in a room by herself. What helps is I pick her up and speak in a soothing voice – she can’t hear but she can feel the speech vibrations from my chest and see the calm expression on my face. At night I’ll bring her to bed and she then sleeps on my pillow or nestled beside me. During the day I see if she’s wanting a refill on her food or for me to open the blinds so she can lie in the sunlight. Aside from her hearing she’s healthy, her bloodwork from the vet is fine, she’s not overweight and does not seem to be in pain. She still “bugs out” a few times a week, usually after coming from the kitty box. She’ll race around the house like a youngster. She is my soulmate cat and hope she can live for years longer. Every day I’m honored that she chose me as her “Mom”. Great post! Thank you….I just want to add that I in my experience, the yowling and other fairly repetitive patterns of vocalization, have been due to either CRF (chronic renal failure) and idiopathic pancreatitis. Both conditions can be immensely helped by giving clysis (sub-q fluids). Another issue I’ve discovered is that feline hypertension might be responsible. Feline hypertension occurs, either alone, or in conjunction with CRF. Also, too tightly controlled blood pressure can cause too low blood pressure and again, that could be at the root of the cases, where physical illness is responsible. Many veterinarians are too quick to dismiss vocalizations as being feline senility and many vets do not regularly monitor blood pressure, and pancreatitis usually requires a special blood test to diagnose, which is not on the standard blood chemistry panel. If your cat is being treated for hypertension, be sure to follow up with routine BP checks to be sure that your dose of BP med is achieving adequate control (BP not too high or too low). Can you tell that that I’m a cat mommy and a nurse, married to a physician, who is a dedicated cat daddy? A great resource on these medical issues is Tanya’s CRF website. Since I’ve long had multiple cats who were friends, I have to wonder if an excessively vocal cat is simply lonesome. Everyone should be able to have at least one friend of their own species, especially if they are left alone all day and are “frantic” for attention when we come home. A chatty cat clearly likes company of some kind. A mellow buddy (I’ve had success introducing calmer, socialized “feral” kittens to my teenaged cats) to curl up with could make all the difference. While some cats may prefer to be solitary, others definitely pine for company. I was just thinking about this too, Lauren – wondering if maybe she could try out fostering a mellow buddy and see how it goes. I want to do that–get a companion kitty–but right now am in an apartment that only allows one cat, unfortunately. But as soon as I move, Pye is definitely getting a fur-friend. Oh, the dreaded one-cat rule! It’s not fair. My calico Corey started to talk thw day after her cat brother died. She was loud, bossy and very demanding. Believe it or not I enjoyed it. She wanted my full attention and showed her displeasure when I talked on the phone or had company. Corey died 18 months ago today at the grand old age of 19. I still miss her bossy demands. I’m so sorry for your loss, thank you so much for sharing about Corey. I like this idea Dweediecat! Keep us posted on how it goes. I know why my cat howls at night soon after we’ve all gone to bed (including his possessive house mate who would rather sleep with me than play with his friend). I think I will go out of my way to give him extra attention before my bedtime, bring him upstairs with me, or find some other ritual so that he will know that all is well and he is part of this sleeping clan even though his clock works differently. 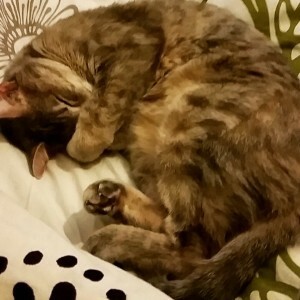 We have found that Tortie’s are the chattiest of cats, even outdoing Siamese in our experience. We ran a cat (and occasionally dog) rescue in Ontario Canada for several years in the early 2000’s, when we had a large house and yard. Over 300 ‘clients’ passed through our doors! A couple of years ago we moved to California, for my husband’s job. We still had some our “foster failures” living with us, but were only allowed to bring 3 cats with us. After finally outpacing the best of the bunch, we chose the 3 to travel the 6000 mile plane trip. Our one canine, a border collie mix, travelled as well. When we were reunited with these 3 kitties a month later, the two old gals were much the same, but the slightly younger fellow was a nut case. He wandered around the house sniffing, and exclaiming his concern. He is huge, and orange, another sort of cat that will chat. Now, we are looking at a shorter move, to a nearby neighborhood. I’m honestly having more anxiety for this move than even the last huge transition! We have even considered the upper scale (and price bracket!) ‘Wag’ pet resort that was featured in the newspaper today. However, back on this planet, I’ve got to get my game plan in order. We close escrow in two weeks, and move in less than three!